With unbeaten champion Braden Currie supporting from the sideline this year, the field was wide open in the elite category. And it was young guns Hamish Elliot and Sam Bell who fought back to take the overall win. 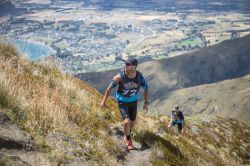 250+ athletes battled six stages, across two days and 150km of the toughest and most picturesque mountain terrain Wanaka has to offer, to cross the finish line in the 2019 edition of Red Bull Defiance. Starting the day with only one thing on their mind, Elliot and Bell set off to chase their time deficit from day one to Team Kaiteriteri Beach – Cameron Jones and Daniel Busch. On a windy day atop Roys Peak, Elliot and Bell charged ahead on the technical 1,480-metre climb to eventually win by over 30 minutes from Jones and Busch. Securing the 2019 Red Bull Defiance title in an overall time of 12 hours, 18 minutes. “It’s really rewarding, great to be out on the track…unreal country to go out and ride around, you can’t beat it” said Elliot. “Being in Wanaka you can’t beat the scenery “ added Bell. In the women’s race, mother of three Kym Skerman and Rotorua Physiotherapist Nic Leary continued their dominance to secure the overall win in a time of 14 hours, 45 minutes. Husband and wife duo Margie and Richard Campbell secured the mixed title in a time of 14 hours, 26 minutes. Team Crossing Peaks took line honours and the overall win in the new X4 category. Richie McCaw’s team Best Foot Forward overcame the set back of an injury on day one to fight on and earn themselves a commendable 6th place overall.